All Equipment - Traust Know How ltd.
Wash with this powerful two compartment washing machine at high efficiency. Flaker blades grind a frozen block into a smooth composition adjusted in thickness and consistency. Mix & Cure very easy and accurate when it comes to controlling salinity and mixing additives. Our spiral conveyor system can transfer salt solids directly from your storage facilities to your processing unit. Our spiral conveyor system enables you to transfer salt supplies in the quantity you need when you need it either via automated refilling system or by manual operation from your work station. Maintain a a specific temperature to protect your product from microbacteriological counts. Available is an extensive range of glazing machines, built to customer needs. Years of experience, our solutions are state of the art. We supply miscellaneous types of tunnel freezers according to the customers´ needs & specifications. This tank construction is a revolutionary new innovation because it handles the fish gently and gives better yield than other methods. Conventional defrosting uses a lot of air in the tank to move the fish and throw in the water to activate the process. 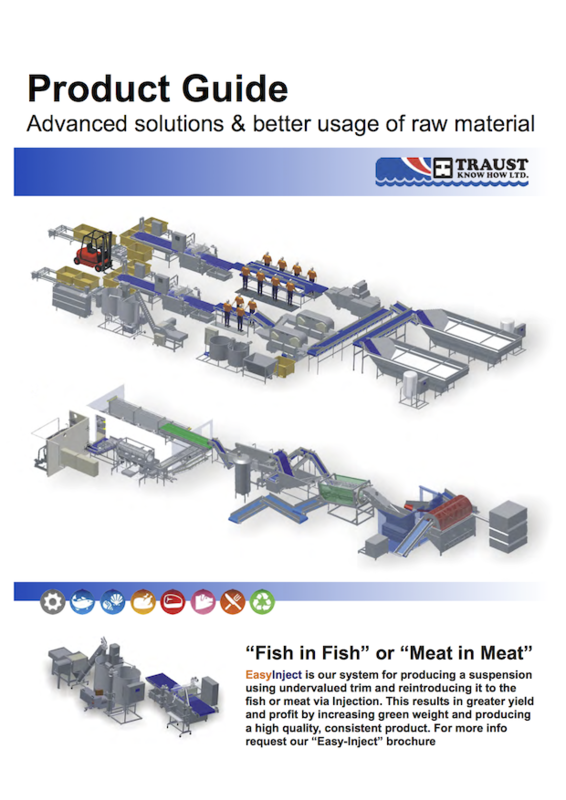 Thaw your product in 5-40 ton batches in a fully automated process. Distributes salt evenly over the fish combined with a brine injector which injects brine directly into fish. The press has more powerful and effective hydraulic system, it operates at higher speed. Load sacks of your prodcut into containers with 10-15% space efficiency gain. The grader is suitable for simple grading and batching of a wide variety of products. Fresh Product Grader FPG100 grades whole fish into a user defined weight categories. The system’s rugged arms quickly swivel out and gently pull each individual piece into the correct chute for its grade. Capacity depends on product size and weight. The Salt Fish Grader is a robust and reliable machine that is capable of withstanding harsh conditions. Operation is simple with a user-friendly touch screen and Ethernet data registration for quality control and traceability. Suitable for grading and simple batching, the grader is designed to fulfill the needs of salt fish grading before the product is packed. Combine a predetermined number of fresh or frozen products into a package with an exact weight. 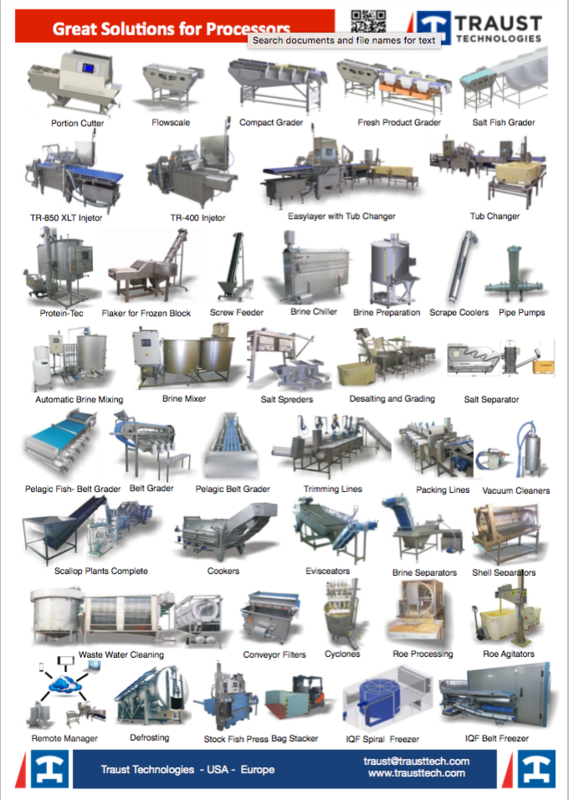 Grade different types of fish on the processing line according to your needs. Gentle handling and a smooth cleaning process are vital for a high quality product. Increase the value of the catch tremendously compared to processing it into fish meal. Shorten the processing time of products traveling on the line and eliminate delays. Trim your product to specified sizes and pack the product ready to go. Transport your product on conveyors with synthetic belts or modular types. Extensive range of flow-lines, with modules addressing each manufacturing state. Separate waste directly after each step in a process and create a high value from the by-product. Pumps with horizontal/vertical tanks of all sizes. Installable both in land base factorys and on-board fishing vessels. A new de-salting machine for salt-fish processor´s The Salt-Separator does not use Vibration or air to catch excess salt of the fish. Electropolished, stainless steel filleting machine for white fish (Cod,Haddock,Saith,Ling,Tusk and comparable species.) and Salmon. See optimal size chart attachment, yellow rows. Electropolished, stainless steel skinning machine for white fish, Salmon,flatfish, and comparable species. See optimal size chart attachment, pink and brown rows. Two extra skinning units. Can be delivered for different fish species than the units on the machine.